A Jewish holiday candy. There are 3 recipes here, all which give a different result for the same idea. Choose the one that seems most to your liking, but eventually you will try them all. 1. Line a baking sheet with wax paper. Set aside. in a medium-sized bowl and cover with cold water, keeping them under water with a small plate or lid. Let soak for about 4 hours or overnight, replacing the water once. simmer over low heat. Cook gently, stirring  occasionally, until liquid is almost gone, about 1½ to 2 hours. handle, spread on the prepared baking sheet. carrots,  tomatoes,  and most fruits. It works especially well on citrus fruits,  removing the peel and not the white bitter pith. down on the orange slices as recipe says. (you will have ½ of a slice of orange:DO-NOT peel), discard the ends. I dryed them in my oven set for for baked goods, or if oven has a pilot light, this worked great if it is a damp day. 6. After drying the slices, toss them in the granulated sugar and reserve them, do not stack them as they will stick together. Chocolate can be melted in the microwave. 10. 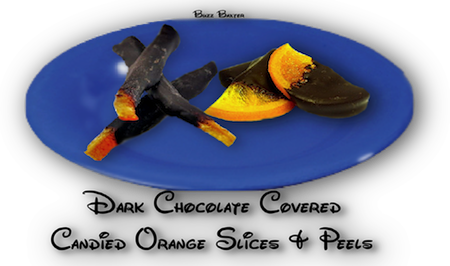 Now dip the orange slices ⅔of the way into the chocalate; gently scrape off excess chocolate against the side of the pan. 11. Place the orange slices on a sheet of wax paper to set.